5017 ✉ 108Bd Baltic sea year-excursion 1931, very nice Zeppelin postcard with multiple franking 50 Pfg. Airmail with violet special confirmation stamp. 5018 ✉ 124Ca 1. 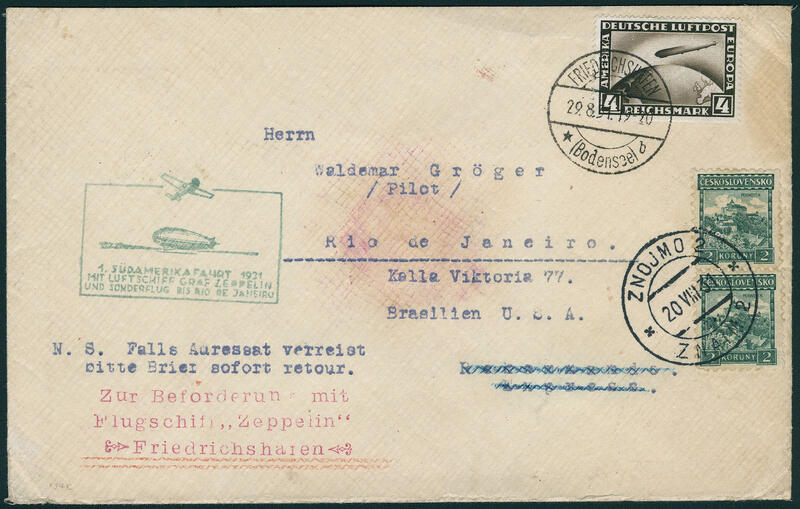 South America flight 1931, more impressive Zeppelin cover with rare double postage Czechoslovakia / German Reich, dispatched in the Czechoslovakia with two ring cancel \"ZNOJMO / Znojmo 20. VIII. 31. \" and German Reich 4 RM. 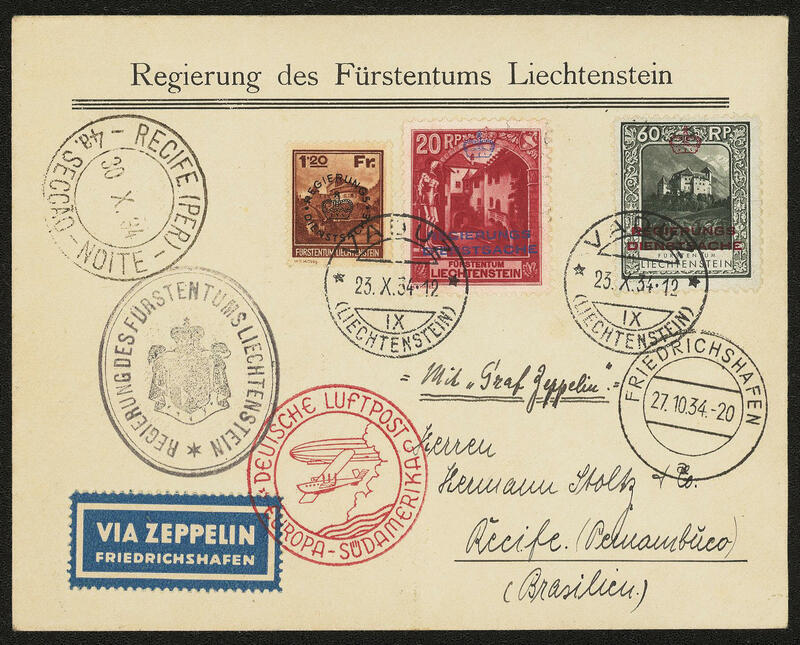 Zeppelin with postmark \"FRIEDRICHSHAFEN 29.8.31. \" to Rio de Janeiro with arrival postmark and green special confirmation stamp of the South America flight. A decorative and very scarce combination! 5019 ✉ 129D 2. South America flight 1931, very nice Zeppelin postcard the round trip with mixed franking German Reich / Brazil and all cancellations in perfect condition, expertized Sieger. 5020 ✉ 150Aa 3. 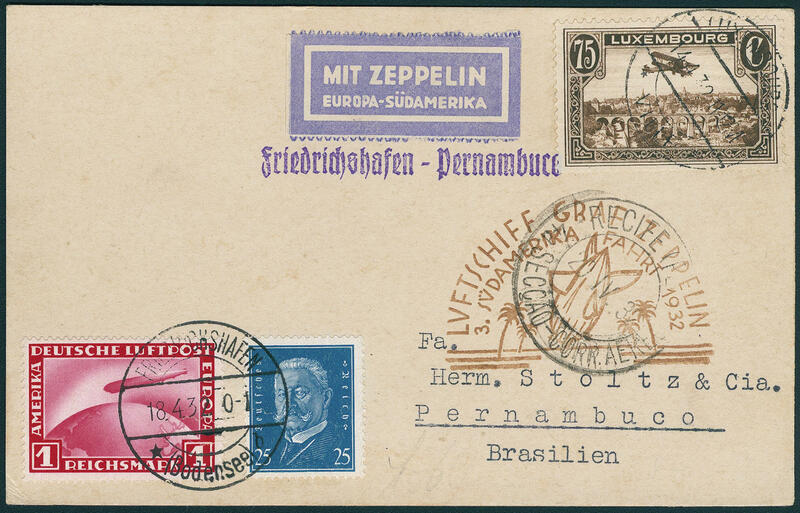 South America flight 1932, very nice Zeppelin postcard with double postage Luxembourg / German Reich with special confirmation stamp to Brazil. Rare! 5021 ✉ 189Aa 8. 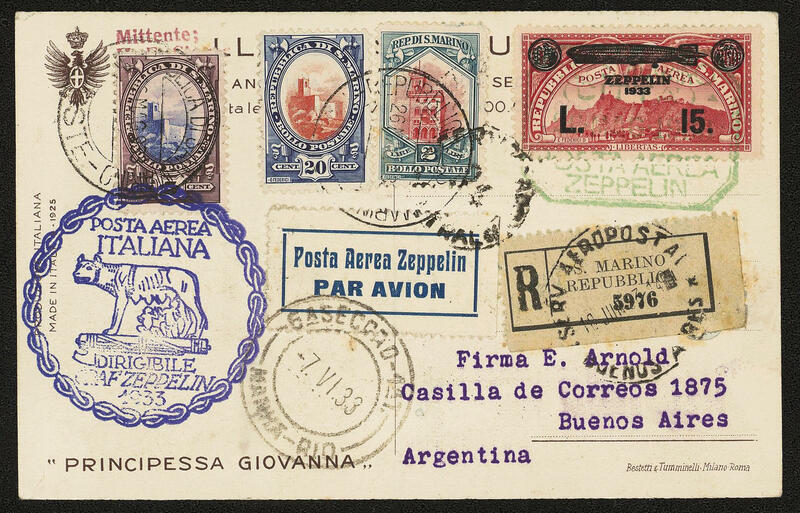 South America flight 1932, wonderful Zeppelin postcard with very nice contracting States franking Papal States with two ring cancel \"CITTA DEL VATICANO 23.9.32. \" to Recife-Pernambuco / Brazil with the corresponding transit and arrival postmarks. Zeppelin documents with Papal States frankings are extraordinarily rare, which here is a particularly beautiful example! 5022 ✉ 195Aa 9. 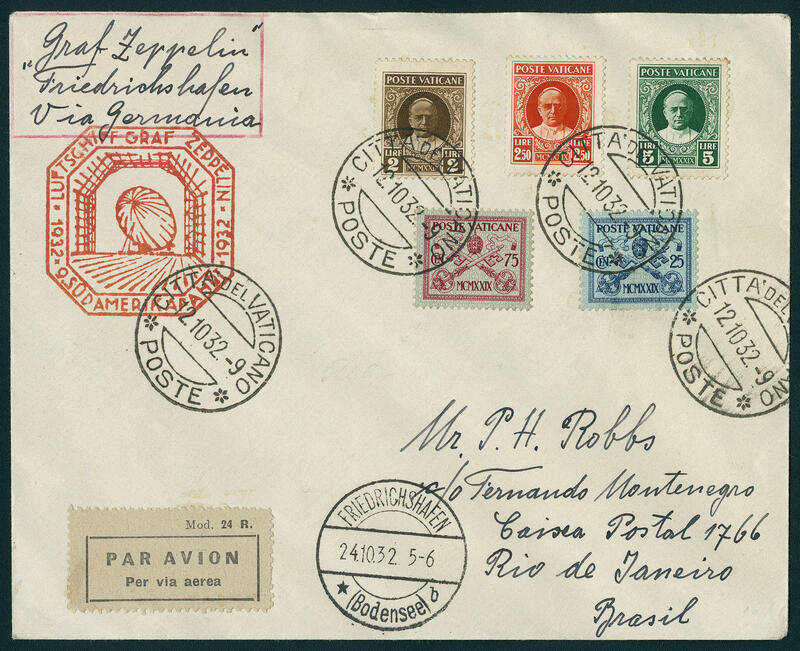 South America flight 1932, wonderful Zeppelin cover with rare contracting States franking from Papal States with two ring cancel \"CITTA DEL VATICANO 12.10.32. \" and clear red special confirmation stamp to Rio de Janeiro / Brazil. Contracting states frankings from Papal States are very rare, whereby it be here about an especially beautiful cover act! 5023 ✉ 202B 1. 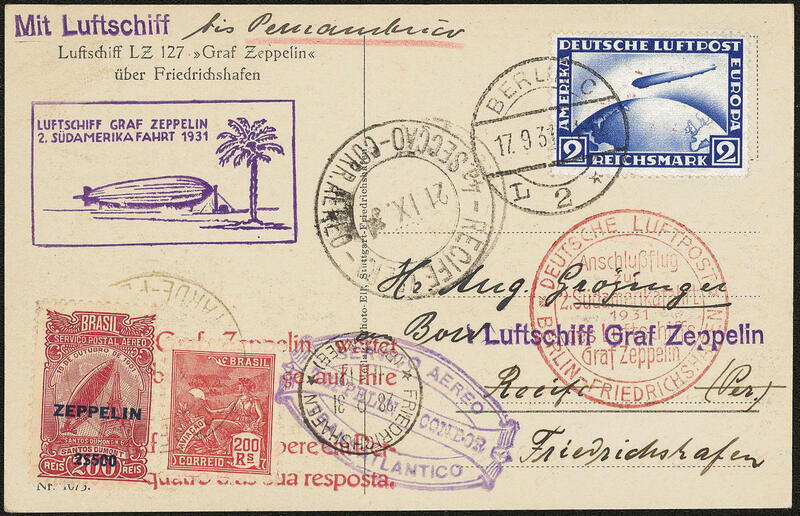 South America flight 1933, very nice Zeppelin postcard with contracting States franking Poland, with connection flight, all postmarks, to Brazil. Rare! 5024 ✉ 202Ba 1. 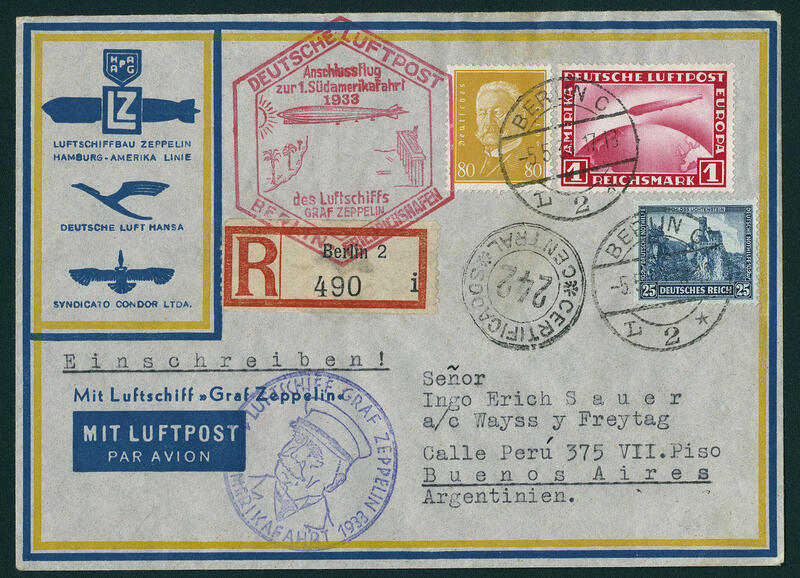 South America flight 1933 with connection flight from Berlin, wonderful registered Zeppelin cover with rare Gdansk franking from \"Gdansk 4.5.33. \" with both special confirmation stamp in red and violet to Recife / Brazil with arrival postmark. A very nice and rare cover! 5025 ✉ 202Ba 1. South America flight 1933 with connection flight from Berlin, very nice Zeppelin cover with 1 RM. 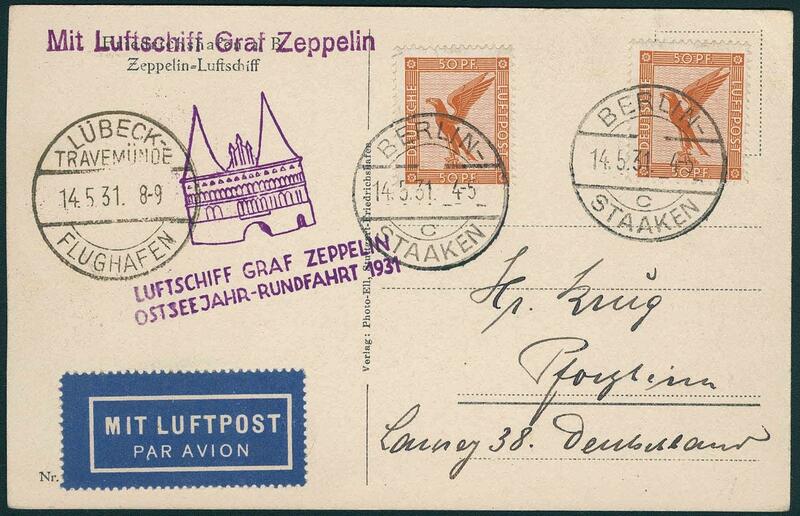 Zeppelin and an additional franking from \"BERLIN 5.5.33. 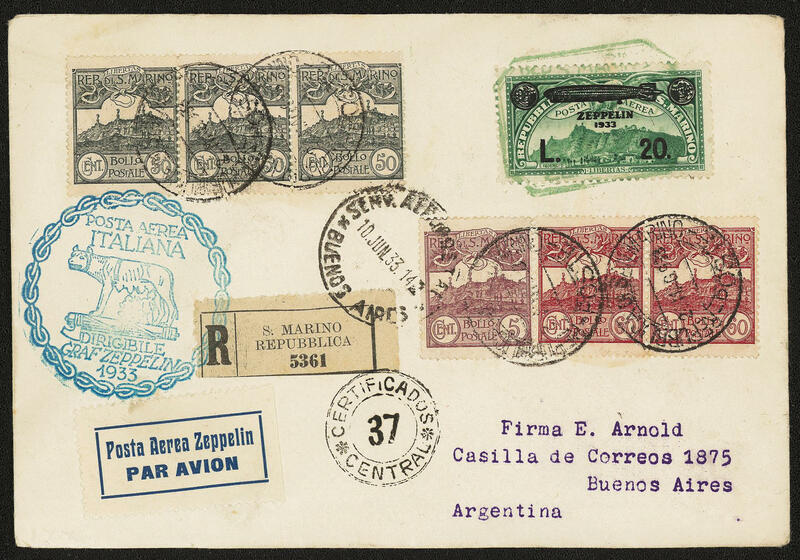 \" with both special confirmation stamp in red and violet to buenos Aires / Argentina with transit and arrival postmarks. 5026 ✉ 209IA/F Italy trip 1933, return flight, the complete Zeppelin series from San Marino on three registered cards and three registered covers, all postmarks. A scarce issue! Sieger catalogue 6600,- €. 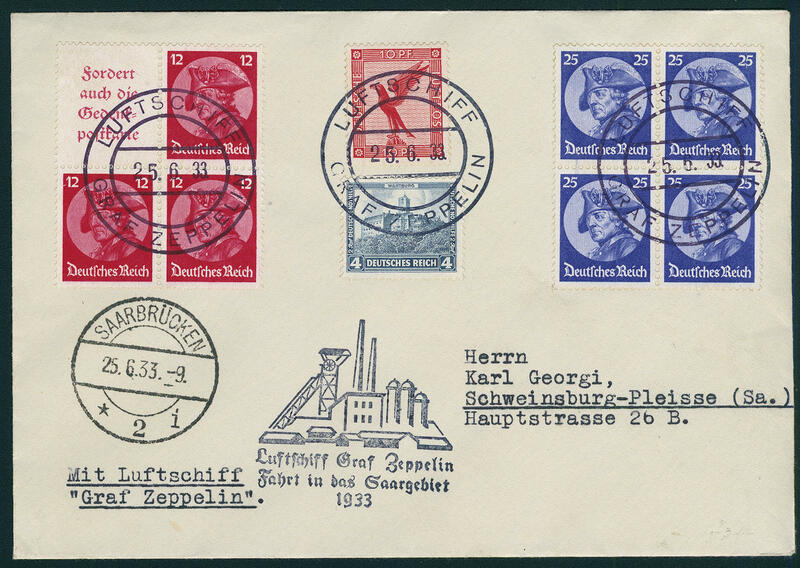 5027 ✉ 217Ab Trip in the Saar region 1933, wonderful Zeppelin cover with very nice franking including a block of four 25 Pfg. 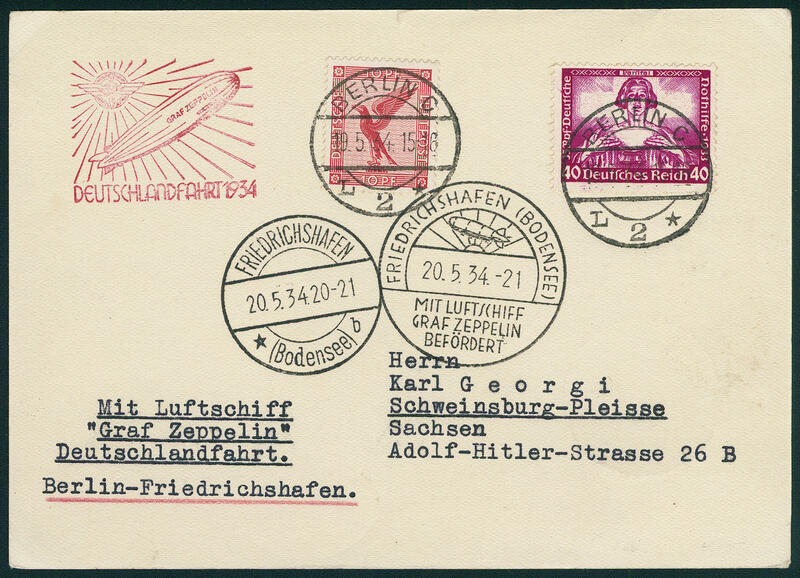 Frederick the Great with on board cancellation mark \"airship Count Zeppelin 25.6.33. \" from of the outward flight with special confirmation stamp and arrival postmark from Saarbrücken, to Schweinsburg-Pleisse. A wonderful cover! 5028 ✉ 223 4. 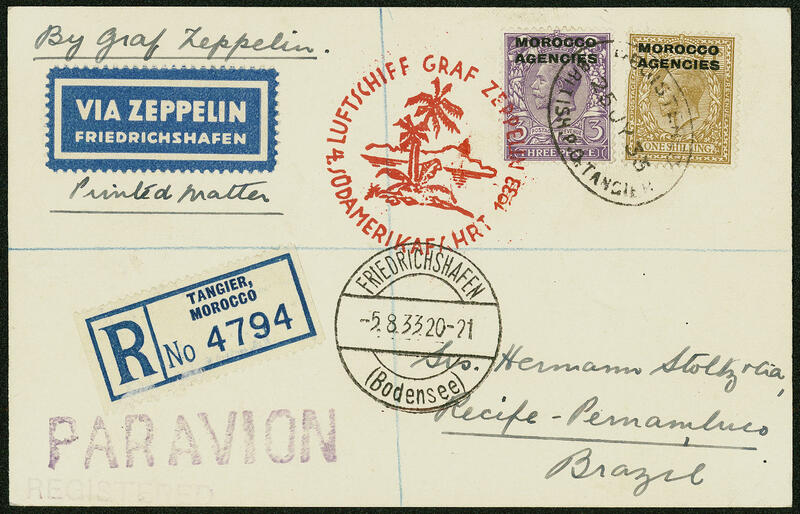 South America flight 1933, very nice registered Zeppelin postcard with rare contracting States franking British Morocco, all postmarks, to Brazil. 5029 ✉ 235Ab 8. 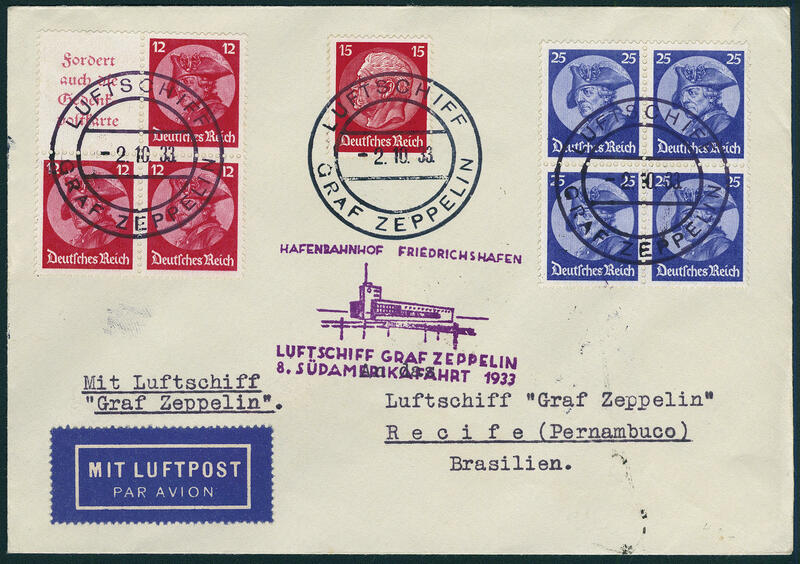 South America flight 1933, wonderful Zeppelin cover with very nice franking including a block of four with 25 Pfg. 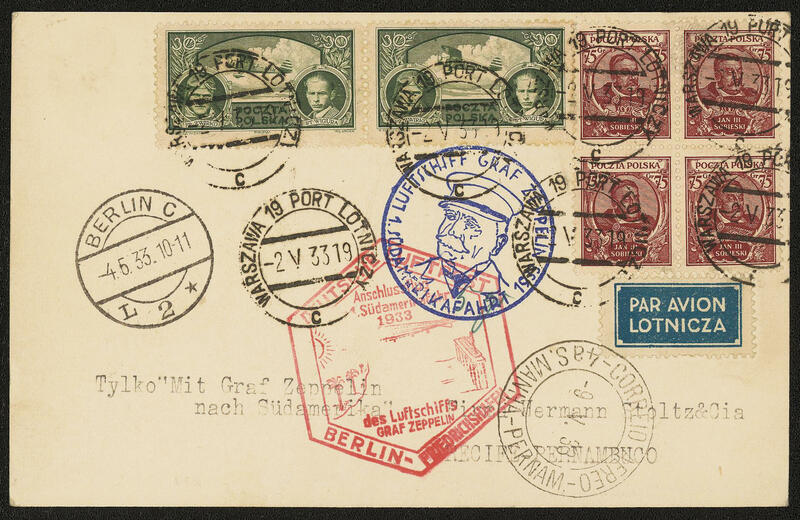 Frederick the Great with on board cancellation mark \"airship Count Zeppelin 2.10.33. \" to Recife with all cancellations. A very nice cover! 5030 ✉ 246Bb Germany trip 1934, very nice Zeppelin postcard with 40 Pfg. Wagner and 10 Pfg. 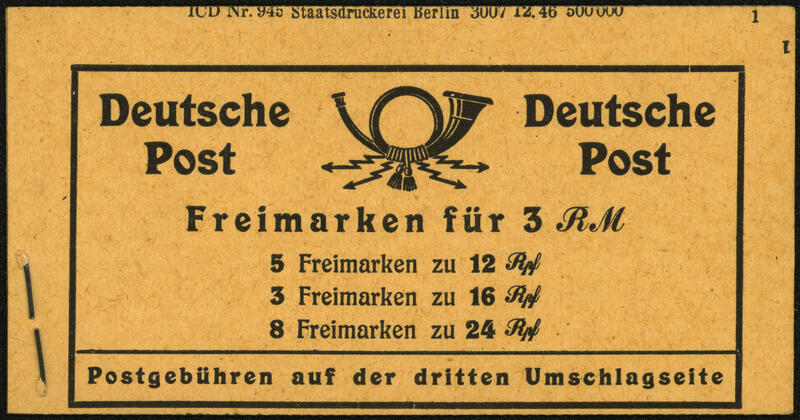 Airmail from \"BERLIN 19.5.34. \" with red special confirmation stamp to Friedrichshafen transported with both arrival postmarks and then to Schweinsburg-Pleisse transported. 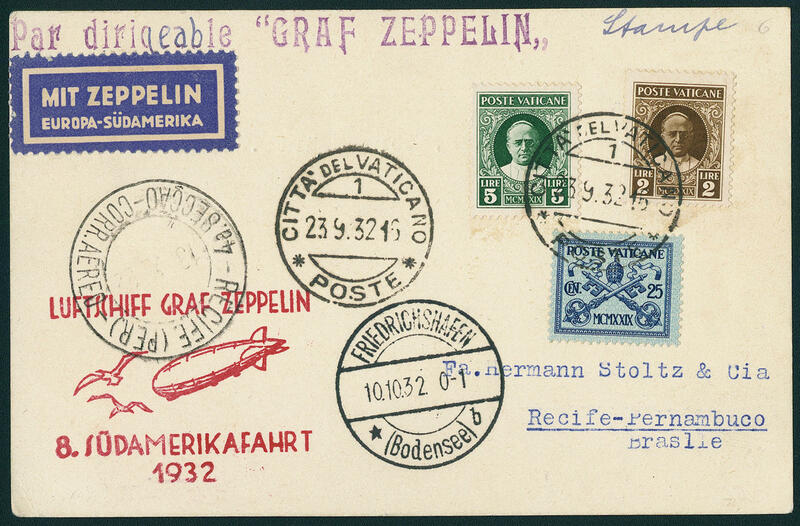 A wonderful Zeppelin postcard with this high-value franking! 5031 ✉ 259Ab Trip to Switzerland 1934, gorgeous Zeppelin cover with wonderful franking 40 Pfg. Wagner and 60 Pfg. Hindenburg with on board cancellation mark \"airship Count Zeppelin 10.7.34. 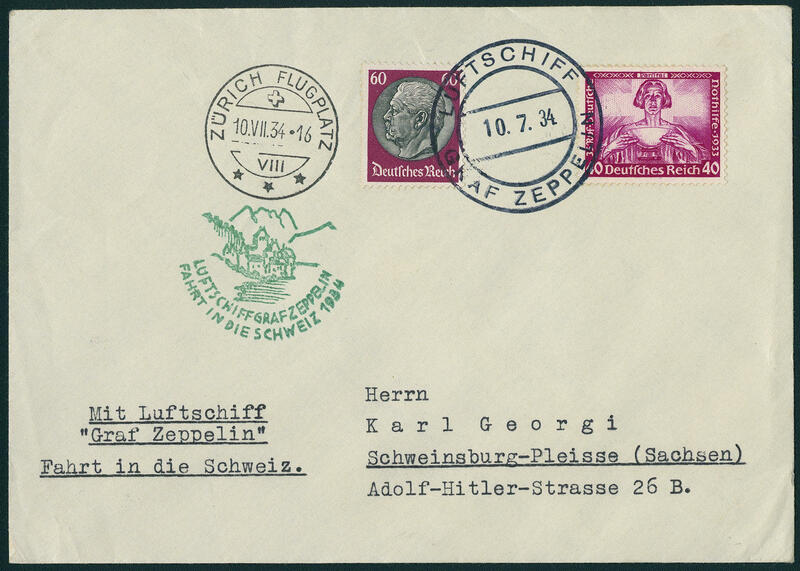 \" and green special confirmation stamp, as well dropping stamp \"Zurich airfield 10. VII. 34. \" to Schweinsburg-Pleisse / Saxony. A very nice cover! 5032 ✉ 283A 11. 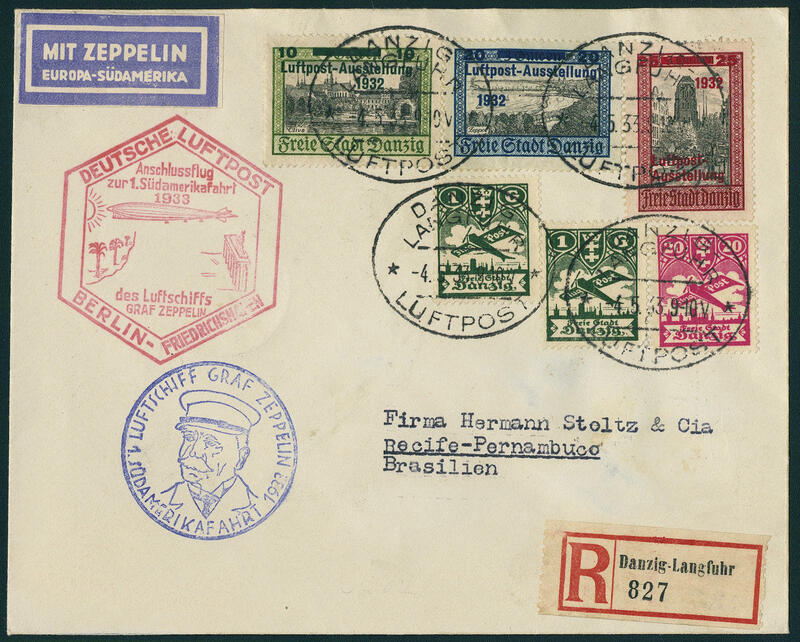 South America flight 1934, very nice Zeppelin cover with good official stamps franking from Liechtenstein, all postmarks, to Brazil. Rare! 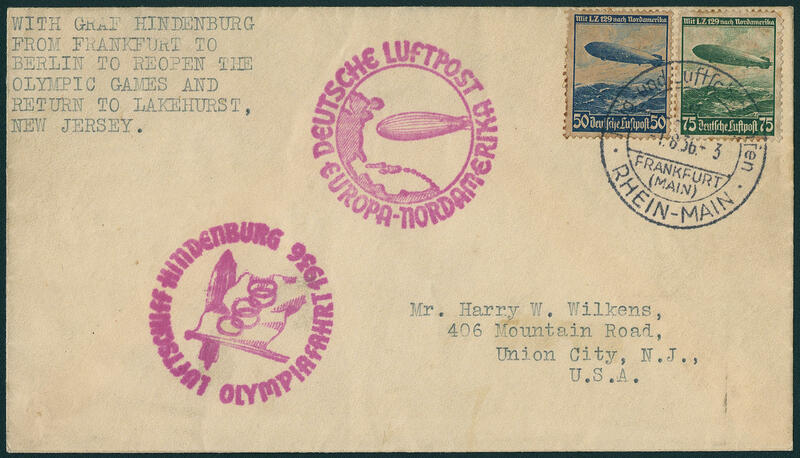 5033 ✉ 427/28 Olympia trip 1936 and North America flight 1936, Zeppelin cover with 50 Pfg. And 75 Pfg. Zeppelin, the with both flights was transported with two ring cancel \"FRANKFURT flight- and Air ship harbor 1.6.36. \" with the both red special confirmation stamp to the United States. An extremely rare combination letter the both flights and in this kind also in the Sieger catalogue unlisted. A top piece for the advanced Zeppelin or Olympic Games collection! 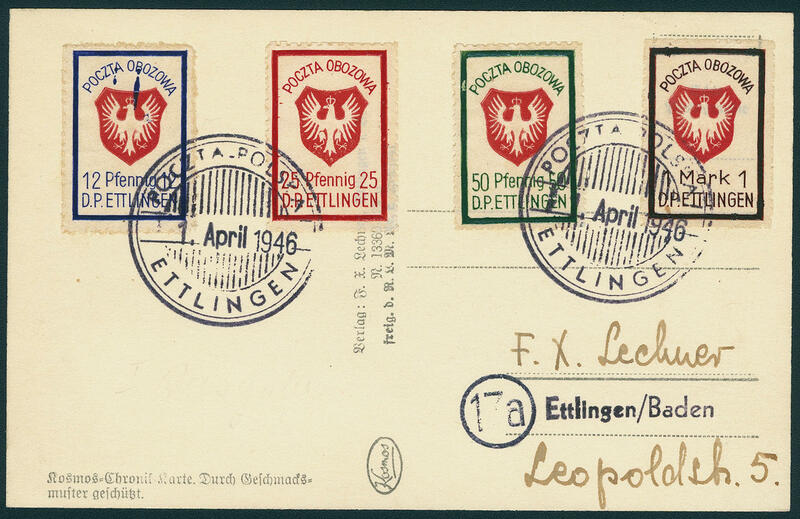 5961 ✉ Ettlingen, all fours values from the Polish POW camp (2. 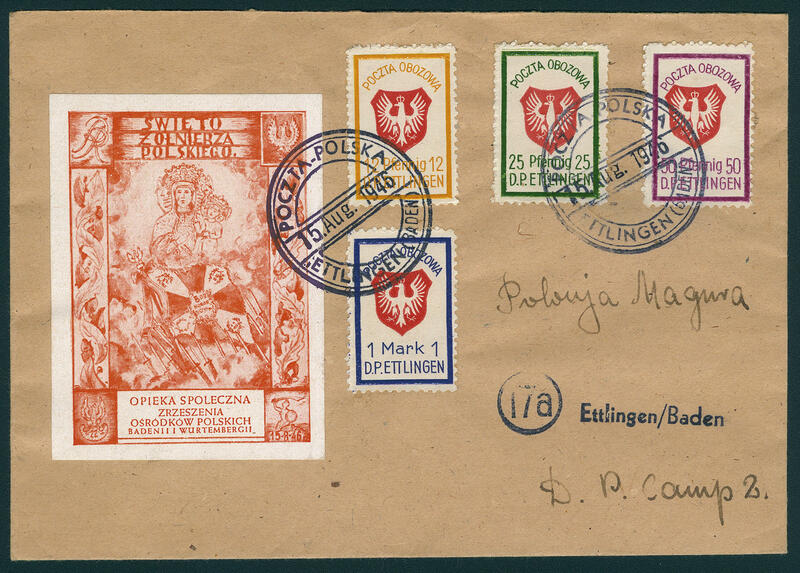 Issue) on cover with vignette and stamp \"POCZTA POLSKA ETTLINGEN (BADEN) 15. August 1946. \". Very rare! 5962 ✉ Ettlingen, all fours values of the Polish War prison camp (1. Edition) on picture postcard from Ettlingen with postmark \"POCZTA POLSKA ETTLINGEN 1. APRIL 1946. \". Very rare! 5960 50Abart Numerals stamp booklet 1946, leading booklet cover extremely strong damaged in cutting, through it inscription \"country printing office BERLIN. . . \" above in lieu of at the bottom, as well parenthesis at the bottom in lieu of in the middle. In this distinct form extraordinarily rare!